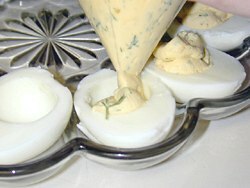 Deviled eggs are a great addition to any picnic, party or holiday spread. They’re easy to make and fun to eat. Using fresh basil pesto gives these eggs an incredible freshness and just a little bit of bite! Meanwhile, cook pine nuts in a small heavy pan over medium heat until nuts are slightly brown and fragrant, about 5-7 minutes. Set aside and allow to cool. Meanwhile place basil leaves in a heavy duty ziplock bag. Zip the bag almost all the way closed, leaving a small opening to allow air to escape. Pound the leaves with the smooth side of a meat tenderizer or roll several times with a rolling pin until leaves are bruised, about 2 minutes. Place bruised leaves, toasted pine nuts, parmesan cheese, garlic, salt and pepper in a food processor and pulse until a rough paste is formed. Then with the motor slowly running, slowly pour the olive oil through the feed tube until all of the ingredients are well combined, scrapping the sides of the bowl as necessary. Set aside. Peel eggs. Cut in half, long-ways. Gently remove yolks from eggs and place them in a medium bowl. Mix yolks, basil pesto and mayo until well combined. Spoon or pipe the mixture into the hollowed out egg whites (see NOTES, below). 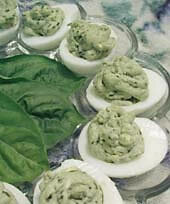 Garnish each egg with a strip of fresh basil leaf, if desired. Cover and refrigerate until ready to serve or, to avoid oxidation, pipe filling directly before serving. This entry was posted on Wednesday, August 29th, 2007 at 4:47 pm	and is filed under Appetizers, Master Recipe Index, Party Food & Snacks, Side Dishes, Speed Queen (30 min/less), Vegetarian. You can follow any responses to this entry through the RSS 2.0 feed. You can leave a response, or trackback from your own site.